This lesson plan offers three consecutive days (~45- to ~60-minute class periods) of narrativized, in-class discussion about the content/concepts conveyed through reading assignments consisting of AccessScience articles, as well as assessment activities and questions. Disciplines covered include astronomy, astrophysics, introductory physics, and particle physics. Assign students the hyperlinked reading list of AccessScience articles provided in this lesson plan (also available as interspersed hyperlinks within the lesson plan narrative) ahead of the specified class day. Set the expectation that all articles will be covered and discussed in class, except the LOOKING AHEAD articles, which while introduced in the class day will be largely covered alongside the readings for the next class day. Use each day's bullet points as a narrative guide, discussion generator, and means of assessment, as well as a look ahead to the next day's subject matter. Test students' grasp of the content using the Activities to Demonstrate Learning Objectives and Test Your Understanding Questions provided in the Assessment section at the end of the lesson plan. Assign students the AccessScience articles in this lesson plan ahead of the specified class day. When students arrive in class, administer a reading quiz using the Test Your Understanding Questions for accountability. Use class time to let students engage in each of the Activities to Demonstrate Learning Objectives described in the Assessment section, working together in teams and submitting the work. Circulate between teams and provide feedback and answer questions. Introduce the subject matter in the LOOKING AHEAD articles, which will be largely covered alongside the readings for the next class day. Astronomy is a broad scientific discipline that includes the study of celestial objects, cosmic phenomena and the nature of the universe. Since prehistory, humans have tried to understand the sky and the cosmos through what our eyes could observe. The invention of the telescope in the early 1600s and its use for astronomy by Galileo allowed us to peer deep into space and behold the cosmos in visible light. In the 20th century, we then learned to "see" beyond visible light to the rest of the electromagnetic spectrum, from radio waves to gamma rays. All these forms of light are conveyed by particles called photons. VISUAL AID FOR DISCUSSION: Review the electromagnetic spectrum presented in the photon article in class. Explain the relationship between energy and wavelength using the example of perceived visual color within the visible portion of the spectrum. The matter that composes stars, galaxies, and other luminous cosmic phenomena emits these forms of light, allowing us to study the contents and behavior of the universe. DISCUSSION: Review various forms of light-based astronomy, broken up by portions of the electromagnetic spectrum: radio astronomy; infrared astronomy; ultraviolet astronomy; x-ray astronomy; gamma-ray astronomy. What do these modes of astronomical investigation have in common? How are they different? LOOKING AHEAD: The neutrino article should prompt many questions that will be answered and addressed during the next day in the Lesson Plan. Neutrinos are elementary particles that are part of the standard model of particle physics. Detecting neutrinos is very difficult compared to detecting photons (light). Amazingly, about 100 trillion neutrinos pass right through your body every second. VISUAL AID FOR DISCUSSION: Photons, the carriers of light, and neutrinos are both elementary particles. Based on the readings and looking at a diagram of the standard model from the standard model article, how are these particles alike? How are they different? The first astronomical detection of neutrinos occurred in the 1960s, involving low-energy particles streaming from the nuclear fusion reactions in the core of the Sun. These so-called solar neutrinos were the first hint of the power of neutrino astronomy, as well as its challenges. LOOKING AHEAD: The neutrino astronomy article should prompt many questions that will be answered and addressed during the final day in the Lesson Plan. After the detection of solar neutrinos from the Sun, the first detection of neutrinos from beyond the solar system—and in fact beyond our galactic home, the Milky Way—came with Supernova 1987A, the explosion of a star in a neighboring galaxy. The next generation of neutrino astronomy was then ushered in with the IceCube Neutrino Observatory at the South Pole, which finished construction in 2010. IceCube uses an unprecedentedly large detection area within Antarctic ice. DISCUSSION: How does IceCube indirectly detect neutrinos? In 2013, scientists announced the first detection of high-energy astrophysical neutrinos at IceCube. These neutrinos pack millions of times more energy than those detected from Supernova 1987A, and are thought to be generated in "cosmic accelerators," akin to human-made particle accelerators on Earth. In 2018, astrophysicists confirmed for the first time that a kind of quasar—specifically a blazar—can serve as a cosmic accelerator. Quasars are luminous objects powered by material falling into supermassive black holes in the hearts of galaxies, which produce highly energetic jets that blast into space. When one of these natural jets points directly at Earth, its source object is known as a blazar. This discovery of a blazar galaxy as a source of high-energy neutrinos is a watershed moment in neutrino astronomy. One of the major goals of neutrino astronomy is to identify the cosmic objects that produce extremely energetic particles known as cosmic rays. High-energy neutrinos are likely generated in the same objects and places as these cosmic rays. Neutrinos are uniquely well-suited for this goal because they pass unimpeded through space to our detectors. This is in distinction to charged cosmic rays, which are deflected by galactic magnetic fields, masking the cosmic rays' true origin point. As for light, it can be absorbed, scattered, or blocked on its way to Earth, and thus conveys incomplete information about its source. VISUAL AID FOR DISCUSSION: Use this depiction from the neutrino astronomy article to explain the first goal of neutrino astronomy. Beyond simple identification, a second goal of neutrino astronomy is gathering unprecedented insight into the inner, physical workings of cosmic ray sources. Candidate objects for producing cosmic rays are active galactic nuclei, including quasars and blazars, as well as black holes in general, along with supernovae and pulsars. Many questions remain about the fundamental nature of these cosmic objects. A third goal of neutrino astronomy is to address major challenges in cosmology, which is the study of the structure and origin of the universe. These challenges include figuring out what exactly constitutes dark matter and what occurred during the initial moments of the universe's existence according to the big bang theory. 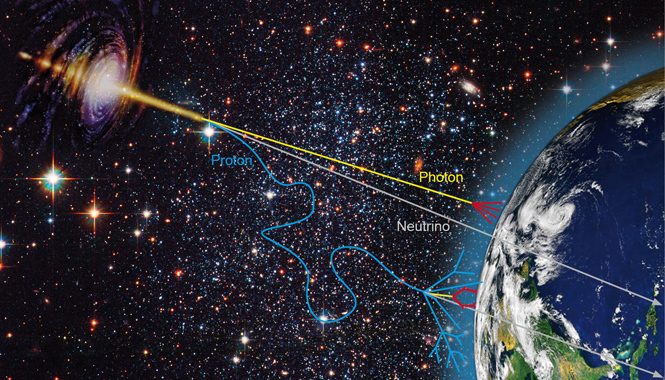 Overall, scientists are eager to continue bringing both traditional, light-based astronomy and neutrino astronomy, along with cosmic ray detections, to bear in deeply studying the universe. This approach, known as multi-messenger astronomy, is the future of the scientific discipline. LOOKING BACK: What are some ways in which neutrino astronomy is similar to traditional light-based astronomy? What are some ways in which the two are different? Assessment answers are available for instructors by contacting AccessScience editors. Students draw and label an electromagnetic spectrum, listing at least one distinctive kind of astronomical observation or inquiry associated with seven broad types of electromagnetic radiation: radio, microwave, infrared, visible, ultraviolet, x-ray and gamma ray. Students design a Venn diagram of the four fundamental interactions and place elementary particles in the portions of the diagram where these interactions do and not overlap, according to the interactions each particle type experiences. For instance, photons experience the electromagnetic interaction, but not the other three interactions. Use these elementary particles: photon, neutrino, electron, quark, gluon, W and Z bosons, and the (hypothetical) graviton. Bonus: Have students place the proton and neutron, the constituents of the atomic nucleus, in this Venn diagram as well. Alternatively, have students fill in the remaining blanks in a partially completed Venn diagram for homework or as an in-class activity. This second diagram will be easier for students who do not have any prerequisite knowledge of particle physics. Both a complete answer key and a partially completed Venn diagram are available in the Assessment answers from AccessScience editors. Students rank the following particles by how difficult it is to detect them: neutrinos, visible light photons, cosmic rays. Students explain their reasoning. Students draw a sketch showing how an object in space generates neutrinos that travel to Earth and can then trigger a detection at the IceCube Neutrino Observatory. The sketch should briefly explain how the neutrino is a uniquely direct link back to the astronomical object compared to other forms of radiation, and the detection principle used at IceCube to register neutrinos. Students create a glossary of terms during their reading that they don't know or understand. Have students refer back to their glossaries at the end of the lesson to make sure they understand those terms. Q: Explain why relying on human vision alone is insufficient for scientists to fully understand the universe. Q: Which has the longer wavelength: radio waves or gamma rays? Which has the higher frequency: radio waves or gamma rays? What does this tell you about the energy of radio waves compared to gamma rays? Q: Critical Thinking: Explain the relationship between a star and a galaxy. For example, how do stars determine galaxy type and composition? Q: What is the difference between a quark and a lepton? Q: Why are neutrinos so difficult to observe compared to photons? Q: Critical Thinking: Why are premier neutrino detectors, such as IceCube, designed to be extremely large, the same as premier optical telescopes? Q: What distinguishes high-energy astrophysical neutrinos from solar neutrinos? Q: What are three goals of neutrino astronomy? Q: Critical Thinking: How can multi-messenger astronomy help deepen our understanding of the universe? If you are an instructor and you wish to obtain answers to the Lesson Plan Assessment questions, please contact AccessScience editors.